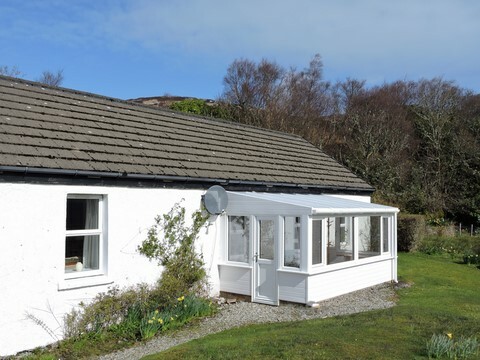 Cove Cottage is set in the hills overlooking Loch Caolisport. It peaceful location means it is popular with those looking for a quite holiday, possibly couples or those who have dogs. Isolated from the rest of the estate, it is accessed by a narrow track up the hill. Favoured by hill-walkers, it has its own garden with access to the hills beyond, and a large grassy field just down from the house, which is great for dogs. The accommodation is all on one level and comprises: master bedroom with ensuite shower room; twin bedroom; bathroom; conservatory with views out over the loch and to the hills beyond; utility room (washing machine and freezer); and an open plan living room/kitchen, with open fire and tiled breakfast bar separating the kitchen and living area. The nearest beach is at the bottom of the road (about a mile from the cottage). Boat owners are welcome to book the cottage, but boats should be left in the harbour as the road is not suitable for towing them up and down to the cottage. © Copyright Castle Sween Bay Hols. Ltd. All Rights Reserved.